With Mother’s Day around the corner I want to tell you about the product line Persuasion. 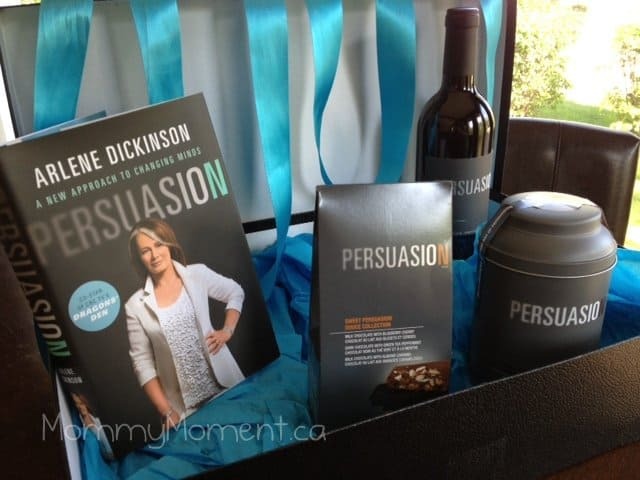 I received a Persuasion gift pack which included a good book, chocolate, coffee and wine, what more could a mother ask for on her special day. Many people know of Dragon’s Den famous Arlene Dickinson who has overcome many obstacles in her own life to make her the success that she is today. She has now taken some of her proven successful steps in her life and placed her ideas on paper to share in her new book. Persuasion is a book all about persuasion and how to achieve success in your own life. Whether you are a stay at home soccer mom or a CEO of a large corporation, this book will offer many insights to make your journey through life more successful with stories and inspirational ideas. We often talk ourselves out of success or think we are not good enough to reach our goals, I loved that the book addressed those specific doubts that often stand in our way of greatness. And what better way to curl up to a good book than with a great glass of bold red wine. I do not claim to be a wino, but I do indulge in the occasional glass of wine. I have had several different types of wine and I know what I like and what I don’t and Persuasion wine is something I like. This bold 2010 Sonoma County red wine is made exclusively for Arlene and Persuasion. A glass of Persuasion wine is a great way to unwind and enjoy a good time with friends or just a quiet evening for yourself. So when you are enjoying your book and sipping on your great wine, it would be nice to enjoy a mother’s other love…chocolate. This imported Belgian Callebaut chocolate is made with only the finest ingredients. This should come as no surprise as Arlene would only want the best for her persuasion line. I had the privilege of sampling the milk chocolate with blueberry cherry, dark chocolate with green tea peppermint and milk chocolate with almond caramel. These chocolates are such a treat, I enjoyed all of them, my favorite being the dark chocolate with green tea peppermint, Mmm! I’m sure there are mothers like me who would love to wake up Mother’s day morning to the smell of a fresh pot of heavenly coffee. 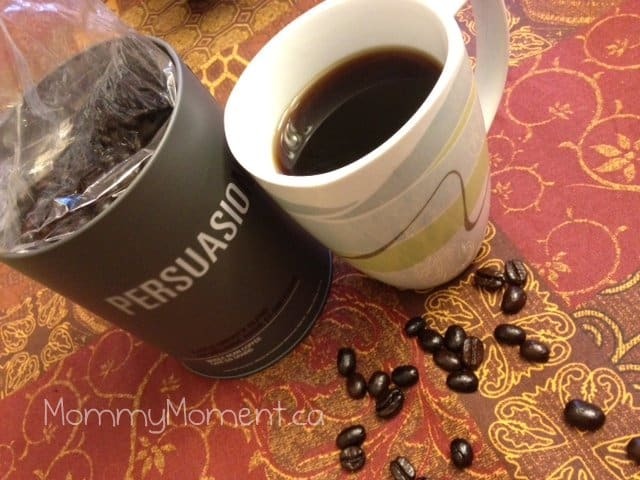 Persuasion Blend Coffee is a rich coffee that is full of flavor that makes you want even more in your morning cup. The Arabica beans are roasted in small batches and is just the right thing you get you going in the morning or to simply enjoy your Mother’s day. These are a few of the great products that can make your mother know that she is just that special. So let persuasion help you make your Mother’s day extra special by giving her some of the things that she really wants this year. Happy Mother’s Day. MMmmm, who couldn’t I “Persuade” with the wine, chocolate and coffee included in this delightful prize pack! All these treats persuaded me to enter this giveaway and I know the book would give me a whole array of new persuasion skills. Awesome! What I learned from website: Dragon’s Den just finished taping their 7th season. I had no idea that Arlene was involved wine. I enjoyed reading about her red on her website, and can’t wait to try it! I learn she supports Breakfast clubs of Canada! Arlene is a mother of four and grandmother of three. she was honoured to become the Breakfast Clubs of Canada and Quebec Breakfast Clubs national spokesperson and raise awareness of the importance of children having a nutritious start to the day. She is successful and not only in the business world. She seems like such a well rounded person and an amazing role model. She inspires me! I learned that she is the CEO and owner of Venture Communications, one of Canada’s top independent marketing communications firms. Arlene is a mother of four and grandmother of three. They also sell OMG’s candies. I learned that 1 in 10 Canadian children are at risk of going to school hungry every day. I learnt her twitter name! I learned that Arlene recommends Balzacs! I admire the work she’s doing for the Help Them Shine Campaign; 1 of 10 kids not having breakfast in Canada is a shameful stat. I learned that Arlene Dickinsons is the CEO and owner of Venture Communications. She supports Breakfast Clubs of Canada. I like the French Persuasion skincare kit. texting BREAKFAST to 45678 to donate $5. And you can go to breakfastclubscanada.org and donate online. I learned that Arlene joined Venture in 1988 and became the sole owner in 1998. I didn’t realize that she had a range of products…would love to try the skin care. I learned that the Persuasion chocolate is made from Callebaut chocolate! YUM!!!! I learned that Arlene won McGill University’s Management Achievement Award. I learned how involved Arlene is around Toronto – like being on the Marilyn Denis show! I learned that Arlene Dickinson is the CEO and owner of Venture Communications and Venture has been recognized by the National Post as one of Canada’s 50 Best Managed Companies three times. That’s great. There was a lot about Arlene Dickinson I knew already, her passion perseverance and generosity along with her toughness, resolve and intelligent… So I dug deeper and looked at the Products she endorses. One that really piqued my interest was the Urban Cultivator which allows one to grow herbs and other green hydoponically year-round (very cool) in small and large spaces. Arlene rocks! I learned that Arlene was added to Canada’s Most Powerful Women Top 100 Hall of Fame and PROFIT and Chatelaine Magazine’s TOP 100 Business Owners. I visited the site and I like THE OMG CANDY..HMMM.. I so want to try them. I like the Balzac’s coffee and would like to try the OMG candy! I learned that she makes her own skincare products, which are made with natural botanical ingredients and have been crafted just for me (!) using classic French recipes. I learned that Arlene earned the McGill University’s Management Achievement Award. I learned that Arlene is a grandmother. Amazing! I learned of the Persuasion line of chocolate with the most mouth-watering ingredients! I like that she has Persuation skin care products as well. I love the Dragon’s Den. The company is purely Canadian. That Arlene feels she is best at being a mother of four and a grandmother of 3! Pretty awesome for such a powerful woman! I learned that you Grow your own herbs and greens year round with Urban Cultivator!! She’s the national spokesperson for Breakfast Clubs of Canada. Venture Communications has been recognized my the National Post as one of Canada’s 50 Best Managed Companies three times. Umm…. that she’s not only a Mother but a Grandmother! It’s no wonder she’s so successful at what she does – she offers the intelligence, guts and heart of gold only a mother can have. Big fan of her on Dragon’s Den. She has three grandchildren! How is she possibly old enough to be a grandmother?! Arlene proves once again she the grand Branding mistress. Leave it to her to know how to “persuade” a market using currencies women use- wine, coffee, chocolate and good reads. I’m a fan of the “den” but I also have tremendous respect for the success she’s achieved through raw perserverance. As a single Mom she learned the ropes of the advertising world as an admin assistant at an ad agency. Now she runs her own! I learned that she is a Grandmother of 3, she looks too young to be a grandmother. I learned that she has a Skincare line too. Isn’t she is the Breakfast Club of Canada’s National Spokesperson? I like “French Persuasion” kit – so lovely! Arlene was added to Canada’s Most Powerful Women Top 100 Hall of Fame and PROFIT. She has lots of achievements!! Very Impressive. The company that she is CEO of (Venture) has been recognized three times by the National Post as one of Canada’s 50 Best Managed Companies. I learned that Arlene spoke at a TEDxYouth conference in Toronto – cool! One of the most powerful woman who supports breakfasts of Canada. I have watched Arlene on Dragon’s Den since she started and have loved her since then. I was however surprised to read that she is the national spokesperson for Breakfast Clubs of Canada and Quebec Breakfast Clubs. Makes me like her even more! Thanks for such a terrific giveaway! 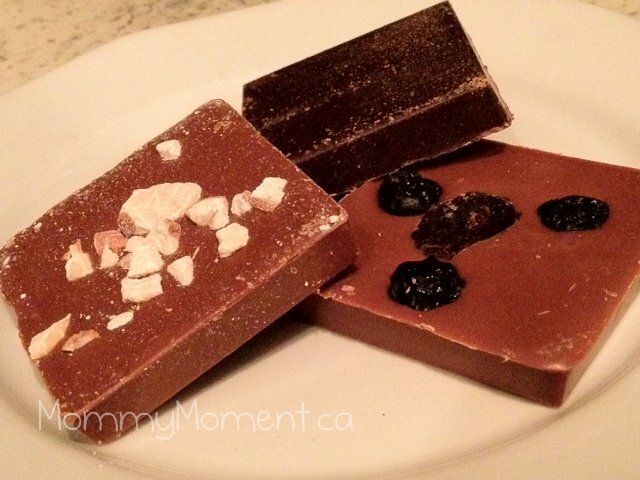 I learned that Persuasion chocolates are artisan-made in Canada and use imported Belgian Callebaut chocolate. Good combination I’d say! I like the design of the website! I also love all of the Persuasion products! Chocolate looks so yummy! I like the French Persuasion kit. i learned that she supports breakfast club in canada! I like how confident she is and that she goes after what she wants no matter who says she can’t do it. What an inspiration for women in the proverbial man’s world. I learned how many achievements shes gained, like Arlene was added to Canada’s Most Powerful Women Top 100 Hall of Fame and PROFIT. I learned that Venture Communications made Canada’s best run companies list! I really like the way the website is laid out. Many websites are hard to navigate and this one is just so clean and simple. Most importantly when I visited Arlene Dickinson’s site I learned about her show The Big Decision that comes on CBS,no I’m not living in a bubble I just haven’t been watching CBS as much as usual and been busy with a lot of the kids school stuff. Anyway, Arlene is just a very busy woman with a very fulfilling life, as if the children and grandchildren don’t keep us busy enough lets throw television shows,books travel and everything else imaginable into the mix. I cannot wait to read her book and learn more about this very successful and inspiring woman. I learned that Arlene has a new show called The Big Decision and I look forward to seeing it. I didn’t know she even had a new show. Sounds like it’s something I’d enjoy watching. Off to google so I can set my PVR. Canada’s Most Powerful Women Top 100 Hall of Fame and PROFIT and Chatelaine Magazine’s TOP 100 Business Owners. I learned that Arlene has 4 children and 3 grandchildren and still has found the time to be such a successful business woman. What an example for us all! Wow, she is an amazing woman… I leaned that shes the CEO and owner of Venture Communications, one of Canada’s top independent marketing communications firms; and that shes got a new show coming out!